Noted California customizer John D’Agostino unveiled this car in 2004, paying tribute to Hollywood film icon Clark Gable, who owned a ’41 Packard One Twenty. Editor’s note: This is the fourth in a 30-day series featuring cars from the Ron Pratte Collection that will be sold at Barrett-Jackson’s Scottsdale auction in January. 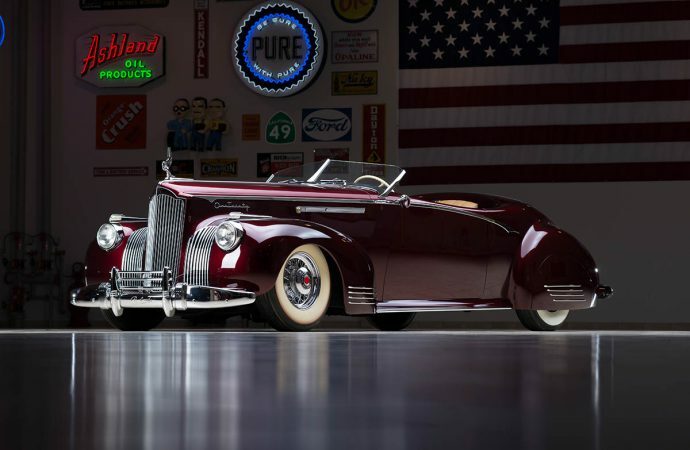 Noted California customizer John D’Agostino unveiled this car in 2004, paying tribute to Hollywood film icon Clark Gable, who owned a ’41 Packard One Twenty. Gable’s car sported a variety of customized touches as Howard “Dutch” Darrin was his go-to guy for such things. This Packard 120 (Lot #2504) flaunts a Carson convertible top and rides on Caribbean wire wheels. Swedish-leather interior underscore the car’s uniqueness in a soft and sumptuous manner. Chrome trim adds sparkle. A freshly rebuilt inline eight-cylinder engine keeps the car true to its roots. Fully street capable, the “Gable” won first-place trophies at the 2004 Grand National Roadster Show and Sacramento Autorama. The 1941 Packard D’Agostino Custom “Gable” (Lot # 2504) is scheduled to cross the auction block in Scottsdale on Saturday, January 17.